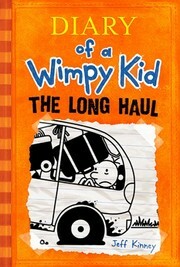 The long haul / by Jeff Kinney. Diary of a wimpy kid ; 9. Kinney, Jeff. Diary of a wimpy kid (Series) ; 9. 100 ME:PersonalName 1 $a Personal name Kinney, Jeff. 264 ProductnNotice 4 $c Date of prod/dist/manuf/copyrt Â©2014. $v Vol. no./sequential designatn 9. 520 Summary $a Summary, etc. note The Heffley family road trip starts off full of promise, then quickly takes several wrong turns--with everything from a fender bender to crazed seagulls--but even the worst road trip can turn into an adventure, and this is one the Heffleys will not soon forget. 800 SAE:PersonlName 1 $a Personal name Kinney, Jeff.